If you are going to visit just one volcano while visiting Costa Rica then I think most would agree that the Arenal Volcano should be your top choice. The entire area is just the perfect spot for the ecotourist to have a vacation of a lifetime with almost every adventure you can imagine available from canyoneering, the top ziplines in the country, and even some excellent whitewater rafting. A National Park of 45 square miles surrounds this volcano. Volcan Arenal is the countries most active volcano. It rises up from flat land, and it is a starkly dramatic sight. Arenal is everything you thought a volcano would be. It is a pefectly shaped cone and stands one-mile tall. 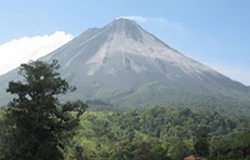 After sleeping quietly for hundreds of years, Volcan Arenal was awakened by an earthquake. Now you can see smoke all day long coming from the cone. At night the red lava flung into the air stands out against the black sky making a beautiful sight. Have someone wake you up if there is nocturnal activity. It seems like you can see Arenal from all over town and out every hotel window. Almost everything in the area is built with a view of arenal. It is one of Costa Rica's main sights. It should be noted to that the guides in this area are very knowledgable and many of our full time guides are residents of the Arenal area because they are surrounded daily by different areas of bio-diversity which has been part of their education since a young age. This is really a remarkable area that should be part of every Costa Rica vacation.